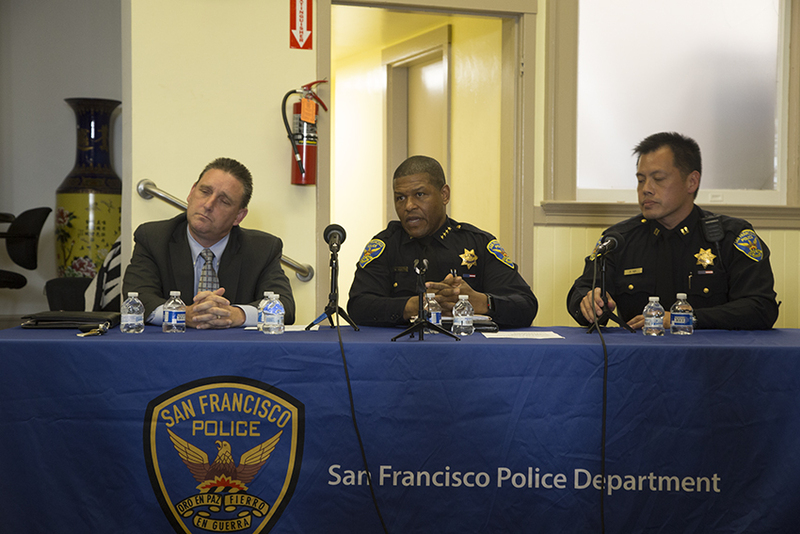 Commander Greg McEachern, left, with Police Chief William Scott in center and Captain Paul Yep, right, at the Town Hall meeting on Thursday in North Beach. Photo by Abraham Rodriguez. Within the darkened hall of American Legion Cathay Post No. 384, police on Thursday night unveiled video footage from the city’s most recent officer-involved shooting, a chaotic June 9 affair. A crowd of around 50 gazed at the cream-colored screen that replayed the moments leading up to the shooting. On Saturday, just hours after the Warriors won their latest championship, footage from an unidentified officer’s body camera revealed him approaching a group of four men on the corners of Grant and Vallejo in North Beach. He questioned the men about open alcohol containers and ordered them to stay put. One man, now identified as Oliver Barcenas was seen running off, sparking a foot chase. The two ran down Grant Avenue as music and chatter bleed out of the bars and restaurants. Just as they are getting closer to three people on the sidewalk, the officer opens fire on Barcenas — apparently shooting him in the back. Then more videos were played, from another officer’s body camera and two more from one of the businesses on Grant. And then, the lights went up, and Joanne Keaney, sitting in front row, shouted “Shame on you!” to Police Chief Bill Scott, Commander Greg McEachern and Central Station Captain Paul Yep. Authorities said a gun was recovered on the scene, a Glock .45 with a laser sight and extended magazine, and claimed that Barcenas shed his jacket and pulled it from his waist during the foot chase. This is not immediately apparent in the officer’s body-mounted footage. Barcenas was depicted in the video unconscious on the ground, and was taken to Zuckerberg San Francisco General Hospital. OIS Case # 180427269 – BWC Footage of Officer #1 from San Francisco Police on Vimeo. The police have determined they cannot yet release the name of the officer. “Before we release, we have to complete the safety assessment of the officer. And if there are no safety concerns we plan on releasing the names within a 10-day period,” Scott said. “What has happened here has not historically happened,” Peskin continued, noting Barcenas could not clearly be seen handling a gun on the videos. But Peskin thanked the chief and the department for their transparency. The praise continued when Fanny Renoir, a resident of North Beach who lives on Grant, complimented the police for how fast they got to the scene and called them “heroic” in the way they dealt with the way they contained the crowd after the shooting occurred. Joanne Keaney, she of “shame on you!” had been sitting in front row across from the chief and said she was “concerned” about the people investigating the shooting, mentioning that district attorney George Gascón has yet to file charges in any officer-involved shooting. “How can the police investigate themselves? That’s no investigation!” Keaney said. Another person who didn’t want to be named got on the microphone and asked a simple question. Natalie April, a former coworker of Barcenas, got to the microphone said she just felt “disappointed” and felt the officer was too brash when he opened fire. “I feel like the officer involved in the shooting jumped the gun. It was really bad. I think this could have been avoided,” she said. Scott said three internal investigations are underway that include the department’s Internal Affairs unit and that the homicide unit would investigate potential criminal wrongdoing. The DA’s Independent Investigations Bureau would also be conducting their own investigation in parallel. Police claim Oliver Barcenas was carrying this pistol armed with 26 rounds when he was shot while fleeing from an officer. 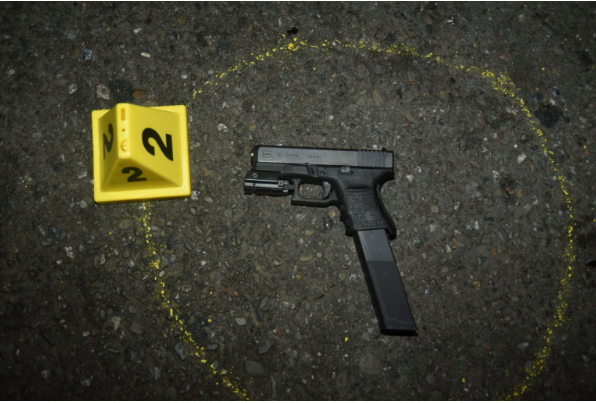 Photo courtesy of SFPD. That group on the corner was in North Beach for one reason and one reason only: to make trouble. Wrong neighborhood, boys. The Blue is much bigger and much badder and you don’t want to go toe to toe. Great work SFPD. Dude with the Lakers tee should be on his knees counting his blessings he wasn’t body slammed, seriously. He was interfering in police work. And grey hoodie guy? You ain’t long for North Beach. Stay on your side of the Bay. And did someone in the crowd actually ask why don’t the police have tasers? Agreed with you until you said “your side of the Bay.” Just another racist comment. Come on Peskin! For real! Sure the gun couldn’t be seen in the videos –your point?! Do you think they planted the gun on the guy??!!! The officer clearly stated right away he saw a gun… end of story. The gun was taken out and very well could have been to shoot the cop. The guy should have never ran. You run from the police you are instantly a threat.